Mavericks are essential members of any community. They don’t shy from controversy and jump right into the messiest of situations, stirring the witches’ brew to a frothing boil. The bold and brash can do their share of damage, but they’re enemies of the status quo—mold-breakers who force to the surface issues that most in authority would rather deal with quietly. Frank Stronach continues to thrive as one of Thoroughbred racing’s mavericks, having recently issued his own 10-point plan for restoring integrity in racing. He intends to implement his plan by leverage “house rules” at his six racetracks. House rule is the authority a company has to determine how business is conducted on its private property apart from what is required by government regulations. The Stronach Group owns Santa Anita Park, Gulfstream Park & Casino, Pimlico Race Course, Laurel Park, Golden Gate Fields, and Portland Meadows. The company also owns the Palm Meadows Training Center, north of Gulfstream near Boynton Beach, Fla.
House rules have been effectively used by Meadowlands Racetrack owner Jeff Gural, who has implemented his own out-of-competition testing initiative and has banned trainers whose horses are failing the tests. Gural’s program went looking specifically for traces of cobalt, a metallic element in cobalt chloride that has been shown, like erythropoietin (EPO), to stimulate red blood cell production and lower lactic acid in muscle tissue. Gural’s testing program has resulted in the banning of two trainers from running at any of his three tracks; he also owns Vernon Downs and Tioga Downs Casino & Racing. At the heart of Stronach’s 10-point plan are several rules to establish tighter controls on the availability of drugs and broaden testing and monitoring. These proposed rules include prohibiting the possession of any medication unless it has been properly prescribed for therapeutic treatment; automatic drug testing for all horses that ship in; implementation of a random drug testing program; banning individuals found guilty of animal abuse; and allowing for complete veterinary records for any horse to be provided upon request and reviewed by a panel of independent veterinarians. The most controversial idea Stronach has proffered is the creation of on-track pharmacies that would be the sole dispensary of any medication used on a racetrack’s property. The Hong Kong Jockey Club operates this way at its two racetracks, but the dynamics there are quite different. Every racehorse in Hong Kong must be stabled at the track and cannot ship in whereas in America, horses are frequently shipping in from other tracks and training centers. Several racetrack veterinarians don’t like the idea of having to get medications through a track pharmacy. Some have voiced concerns about facing an emergency with a horse and losing precious time while a badly needed prescription got filled. Dr. Sid Gustafson, a veterinarian and teacher at Ontario’s Equine Guelph, wrote recently on his blog that such a system has merit and would begin to eliminate “indiscriminate inappropriate treatments that have led to breakdowns and doping problems. To deal with emergencies, Gustafson recommended the tracks make available the equivalent of equine emergency medical technicians to deal with trauma and colic. Certainly the devil is in the details, but Stronach’s proposal to attack medication overuse at its source warrants serious debate. On-track pharmacies could be an important piece of the enforcement puzzle. 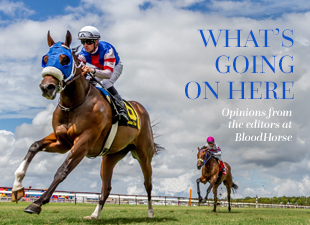 If a horse tests positive for a substance that was not prescribed, then it becomes much easier to enforce the rules—eliminating debates over picograms per milliliter and simplifying the question to whether the medication was prescribed: Yes or no? On-track pharmacies would also provide an unprecedented level of transparency regarding medication use, which is another plus. Add more robust out-of-competition testing and an increasing number of racetrack owners willing to show violators the door, and restoring horse racing’s integrity moves out of the realm of hope and actually becomes attainable.